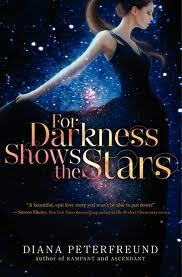 I was searching on Goodreads.com for something new to read and found the prequel to another story that i readlly enjoyed ‘For Darkness Shows the Stars‘. This prequel takes us deeper into Kai’s story – once he leaves the North Estate and travels to Channel City. Once he finds himself as a ‘free post’ in Channel City, he sees that life isn’t as expected- the Posts are living a lifestyle that is quite different than any post lifestyle in servitude. They wear clothes that only Luddites so far had worn and they have more money than they ever had when living on an estate. So Kai works for a tailor at first and then when his mechanic ability is discovered by Pen – a Post who’s a ‘master’ that’s instilled the fear of God in people, he has no choice but to go and work for Pen. That’s when Kai hears of the Innovations and where he’s plans unfurl. It’s a short read, and not as in depth as i would have liked, but it was a nice quick read. I kind of wished that there was more of a deep dive into Kai’s story and a lead into what we get in ‘For Darkness’ since that was quite the interesting tale, but none the less – it killed time and was worth the $2 that i paid for it. 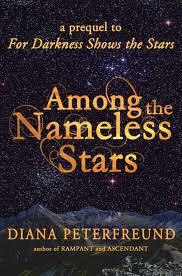 This entry was posted in Dystopian, Reviews and tagged Among the Nameless stars, Diana Peterfreund, for darkness shows the stars by iscm13. Bookmark the permalink.